Explanation: As 1997 fades, so does the Great Comet of 1997: Comet Hale-Bopp. Discovered even before the Great Comet of 1996, Comet Hale-Bopp became the brightest comet since 1976. 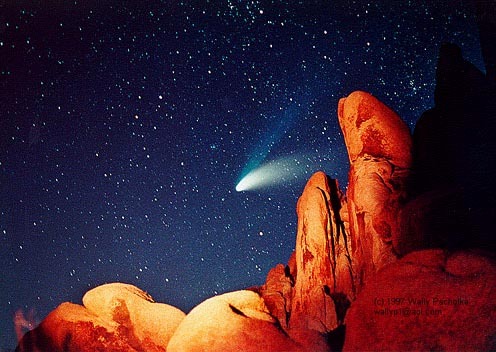 Many will remember Comet Hale-Bopp as a comet with a coma so bright it could be seen by eye even when near the Moon. Others will remember spectacular photographs that appeared in magazines and on the web. Amateurs, inspired by the beauty of the comet, took most of these photographs. In particular, today APOD salutes Wally Pacholka, who took the above famous photograph. Mr. Pacholka reports that he repeatedly drove 150 miles to a national park, stayed up half the night, and took hundreds of photos while carefully waving a flashlight to momentarily illuminate the foreground. His equipment consisted only of a standard 35-mm camera which, for pointing accuracy, he piggybacked on a telescope bought at age 12 with money earned from a paper route.